Tu B’Shevat, with its seder of fruits, nuts and wine to mark the New Year of Trees, is celebrated on January 30th this year. It’s a wonderful time to reflect on the bounty of produce we have year round in the Bay area. The custom at Tu B’Shevat is to eat the foods mentioned in Deuteronomy 8:8 -- wheat, barley, grapes, figs, pomegranates, olives and dates (since the honey mentioned is thought to be date syrup). Many also include carob and almonds, traditional foods of ancient Israel. Pomegranate molasses gives the fish a fruity tang. It can be found in gourmet, Jewish and Middle Eastern markets. Preheat oven to 450 degrees. Place filets in single layer in glass baking dish. Mix pomegranate molasses with brown sugar. Spread evenly on top of fish filets. Sprinkle zest, garlic, salt and pepper over fish. Cover dish with foil and cook in the oven for about 10-12 minutes or until the fish is cooked through. Serve on top of cooked spinach. Garnish with pomegranate seeds. This was unbelievably tasty. I think I liked it better than the traditional bulgar or couscous tabbouleh (sometimes spelled tabbouli). Combine all ingredients. Mix well. Taste and correct seasonings. These look like chocolate but have the malty fruitiness of carob. The recipe should work well with cocoa instead of carob if you prefer. Preheat oven to 350 degrees. Oil or spray an 8-inch square baking pan. Combine raisins, figs, dates and almonds in a bowl. Mix with sugar. Set aside. Melt butter or margarine in a large glass bowl in microwave. Stir in eggs and vanilla. Mix well. Add carob, flour, and baking soda. Mix well until combined. Mixture will be very thick. Heat honey to make liquid if necessary. Mix in honey. Slowly stir in dried fruit, nut and sugar mixture until well combined. Pour into prepared pan and bake for about 35 minutes until center is set and springs back to touch. Allow to cool completely in pan on rack. Cut in 16 bars. I've written about Tu B'Shevat before as part of a post about pomegranates (including how to seed and juice them). To see that post and another with recipes from other food bloggers, please click here. 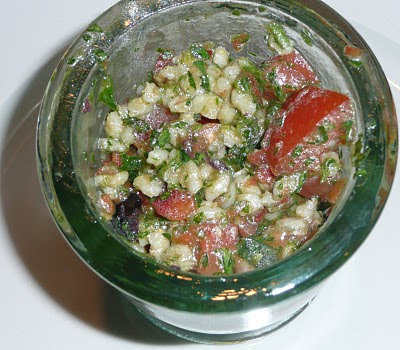 The barley olive tabouleh sounds especially delicious. You are my mideastern food expert, too! The link on Facebook was all screwed up when I clicked it (although it looked okay in the comment; one of those odd Facebook things I guess) but I found it by googling, Looks great!